CULLMAN – Devin Wyman is not your typical former football player. Yes, he played at a high level in college. Yes, he made it to the NFL. Yes, he played with one of the greatest quarterbacks to ever take the field (Tom Brady) when he was with the New England Patriots and is also an AFC Conference champion, but this is not what makes the 6-foot-6, 320-pounder stand out….it is his love and commitment to the Lord and his fondness for the Fellowship of Christian Athletes (FCA). 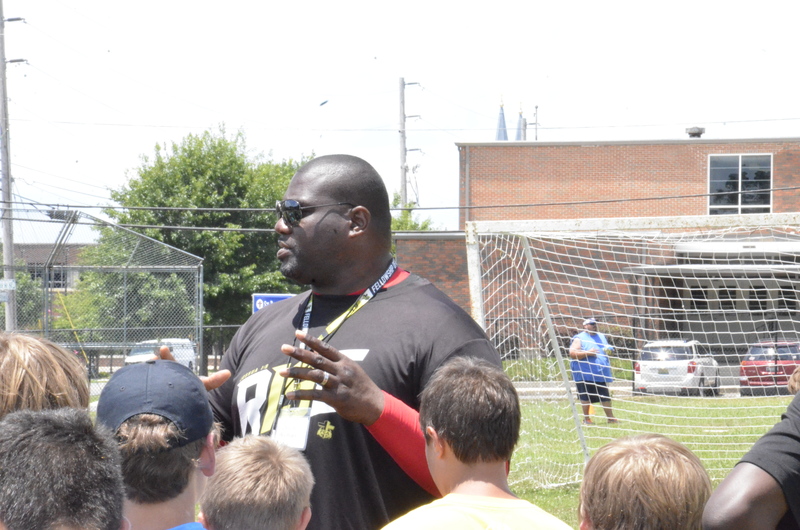 Wyman was a part of last week’s FCA Power Sports Camp in Cullman. Wyman was born in East Palo Alto, California to a mother with a strong faith. He says it was hard to get the same spiritual connection, but that all changed when he got to the NFL. This was a big influence on the life of Wyman, as there are not many opportunities for church or faith-based activities in the NFL, where teams are constantly on the road and playing each and every Sunday. “You would have Bible studies on game days. Every stadium may have chapel. You would walk through an airport and they may have chapel, but it wasn’t mandatory. Even in the NFL today, not every team has chapel so a lot of people are blinded, not aware, so my walk and my belief was not there,” said Wyman of his faith while in the NFL. Far removed from his days playing on the gridiron, Wyman now devotes his time to teaching the younger generation about Christ, as well as football, at various FCA sports camps. It was my distinct pleasure and privilege to get to spend some time, no matter how short, with Wyman and hear him talk about his faith and how God has impacted his life. I walked away from the interview with a better understanding of his dedication and devotion.